Christmas in September was suddenly really appealing when I spotted this lovely cover and the chance to try out a new author. With it's lovely cover and enticing description this book seemed liked a sure thing, so it was with some surprise and a little disappointment that I found it didn't quiet work for me. 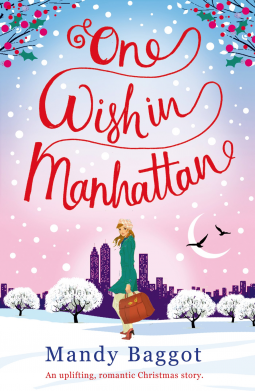 Hayley deserves a lucky break and is off to New York with her daughter for Christmas to visit her brother. Or so we are initially led to believe because later we find there is more on the agenda. The attention to detail in this book is really good. I liked the basic idea behind the story, and loved the relationship with plus all the lovely between Hayley and her daughter Angel. There were also some lovely moments with both her brother Dean, Vernon and Randy too. In fact there is lot I did like about this book. However there was also a lot of stuff that didn't quiet work for me, for example how she met Oliver's mother, his behaviour and how she got involved with Mr Meanie in the first place. Her preoccupation with cutting up her clothes was daft. Who on earth cuts the sleeves of a wool dress to visit a nightclub or substitutes jumper sleeves for gloves instead of buying or borrowing a pair. On the other hand it was a really nice story if you are prepared to take everything at face value and the text flowed well making it good light and amusing reading. The quality of the writing alone makes it recommended reading but just not for nit pickers like me. Rachel via GoodReads - "This was the perfect book for me to get my Christmas reading off to a start with this year and was truly enjoyable. Kirsty via GoodReads - "This book made me feel so happy ... I loved the Chemistry Hayley and Oliver had and Angel was such a funny girl.